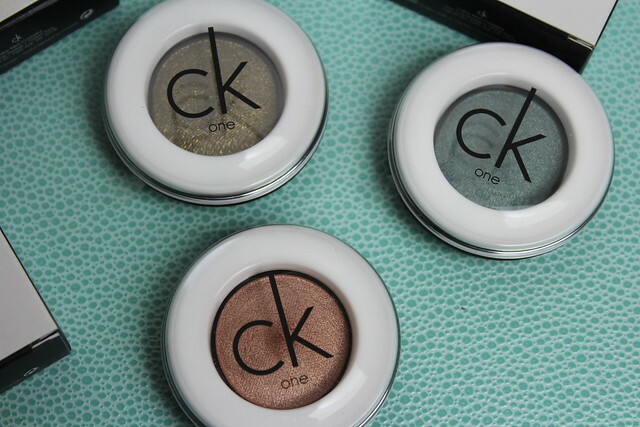 CK One make-up is an interesting range, the packaging is quirky and the products are interesting and there are some lovely things in there – yet it’s not one I’ve heard much buzz about on blogs?! That was until these shadows came on to the radar – and these my friends, are fabulous. 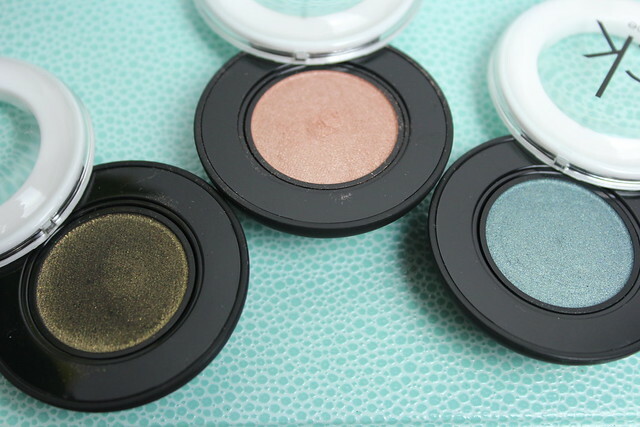 These are the new single eye shadows from the brand and definitely worth a little rave about! 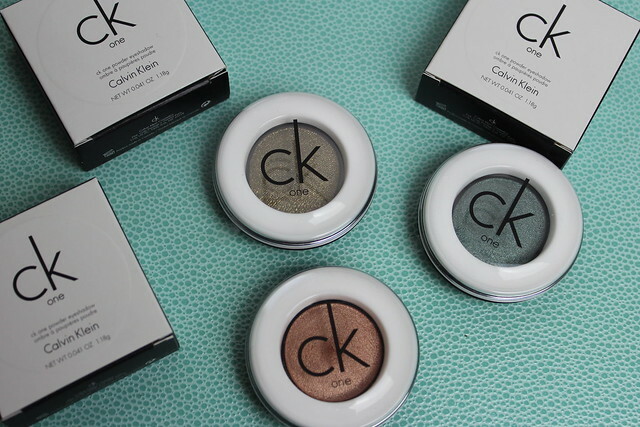 Starting with one thing – the packaging is typical Calvin Klein cool, with little white and transparent lids that swivel around and reveal the colour that’s housed in a little NARS-like matte and black, slightly rubberised feeling base. Different to any other packaging out there! Seriously, just look at Fearless? In the pan it’s a shimmering olive green, but swatched it’s abouts as gorgeous a deep black as you can get…. but before I get carried away raving about that one shade… I’ll do a run down of each of three here. Fearless: The olive green, black base with golden shimmer. 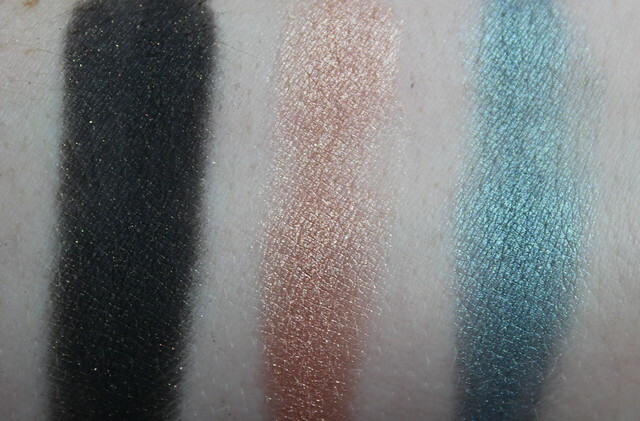 This is gorgeous – look at the pigment. If you want a dark smokey eye, with something a little different to it, then this is a total winner. It’s rich black but the golden/olive shimmer glistens to give it something a little twinkly and different. That’s one swipe of colour by the way – I know. Amazing. Ambitious: The peachy golden pink shade, this is my favourite of the bunch in terms of (predictable) easy to wear shades – this is silky smooth and feels almost like a lovely mousse like shade. That’s how smooth they feel to apply – again the pigment is amazing and I adore this shade. Liberated: The colour of the trio, this is an interesting one – in the pan it looks like quite a cool toned, simple shade but it does add a little something extra when you apply it. The colour looks richer when applied – it’s a lovely pigmented shimmering shade that has a lovely depth to it, and again a pigment that’s seriously impressive. The texture and pigment is what sets these shadows apart – there’s another one called Driven that’s pretty amazing looking too.. officially on the wish list! What do you think? Which colour stands out and anything here made it on to your wish list? I’ve tried their nail polishes and they were horrific, so that really put me off the brand. These eyeshadows don’t seem too bad, but ambitious is probably the only shade I’d really want to try. For the price point though I’d rather pay a couple pound more for a UD shadow single that I know will deliver. I really like fearless and ambitious! They look lovely and really pigmented!